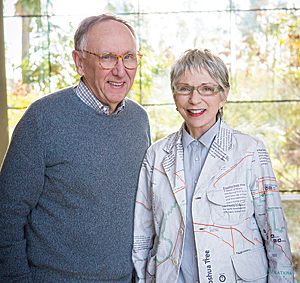 Esri founders Jack and Laura Dangermond received one of the nation's most prestigious environmental awards, the Audubon Medal, during the 2015 National Audubon Society Gala Dinner held in New York City in March 2015. The Audubon Medal is one of the highest honors awarded for conservation. It has been given only 53 times. Past recipients include Rachel Carson, Robert Redford, Ted Turner, and the Rockefeller family. The award was presented to the Dangermonds in recognition of their outstanding achievements in the field of technology and conservation innovation and their support for research institutions, schools, and nonprofit organizations. David Yarnold, president and CEO, and David Ford, chairman of the National Audubon Society, presented the award and noted that Esri's development of innovative technology has allowed the National Audubon Society to advocate for conservation solutions and share data. This has also empowered citizen scientists who are members of its chapters across the country. With the help of Esri technology and the support of the Dangermonds, Audubon has been able to improve the world and drive change using the power of GIS. Jack Dangermond accepted the award on behalf of colleagues at Esri, partners in the NGO space, and Esri users all over the world. He observed that,"Their work is the real science." Dangermond believes that "GIS will fill in all of the blanks and will become a nervous system for the planet." While noting his respect for everything about nature, Dangermond also emphasized the importance of what is happening in the technology world. "If we can bring these two worlds together, like what the Audubon Society is doing, I will have a lot more hope for the future." Jack concluded his remarks saying, "I am very deeply moved by this honor, and I am going to respect it for the rest of my life."